Which one is the ultimate muscle recovery drink? When it's time to choose a beverage to chug after those push-ups and sit-ups, there are tons of options out there: ice-cold water, pure squeezed fruit juice, or the thirst-quenching sports drink. 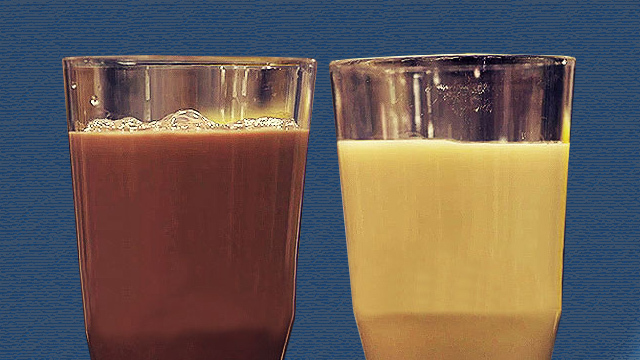 But there’s one more post-workout recovery drink you should add to your list: chocolate milk. National Geographic Channel challenged two volunteers to put their bodies to the test to determine which is the best post-workout recovery drink. And what drink fits the bill? Chocolate milk. Another study by coach, competitive swimmer, and Indiana University professor Joel Stager, entitled Chocolate Milk as a Post-Exercise Recovery Aid, further proves that this old-time favorite is the optimal after-workout must-have. Stager’s study also showed that compared to plain milk, water, or most sports drinks, chocolate drink has double the carbohydrate and protein content, perfect for replenishing tired muscles. Dehydration is also prevented as chocolate milk’s high water content replaces fluids lost through sweat. Plus, its nutritional bonus of calcium, sodium, and sugar help recovering athletes retain water and regain energy. So should you start ditching water? Not entirely. Drinking plain water after exercise replaces sweat losses—and that's it. "Chocolate milk provides carbohydrate replenishment to your muscles—something they can metabolize," said Jason Karp, MS, another researcher for Stager's study. "There's nothing to metabolize in water."